Are you viewing the right article? This article refers to Digital Publishing Suite. For the AEM Mobile article, see Create articles in InDesign. If you’re basing a digital magazine article on an existing print article, creating a new document is usually the easiest approach. To repurpose a document, you can change settings in the Document Setup dialog box. Specify a page size (such as 1024 x 768 for the iPad SD) and orientation (portrait or landscape). For dual-orientation folios in which customers can view content either horizontally or vertically, you can create two separate documents for each article—one portrait and one landscape. If you’re using InDesign CS6, you can also create alternate layouts within the same document. Do not use facing pages in your source documents—use only one page per spread. Turn off facing pages. Do not use the Page tool to change the page size, unless the page is smooth scrolling. When creating your design, remember that a 6-pixel scroll bar crops the right edge of the article layout. Consider adding a guide or object on the master page to mark this area. When designing layouts, you might want to account for the navigation bars that appear when users tap the background. The top navigation bar is 20- or 40-pixels (SD or HD) for the system status bar plus 44- or 88-pixels for the top navigation bar. The bottom navigation bar is 44- or 88-pixels. Enterprise apps can display an additional navigation bar with custom navigation icons. This additional navigation bar is 56- or 112-pixels. To avoid large folio files, use properly sized JPEG and PNG files for interactive assets such as image sequences, pan & zoom images, and panoramas. For non-interactive images or slideshow images, you can use any format, including PSD, TIFF, AI, PDF, and JPEG. When you create an article or layout, the non-interactive objects on each page are compressed and converted into a single PNG, JPEG, or PDF background image file. Similarly, slideshow and button images are compressed into PNG files. When creating images to be used in interactive overlays, use the Save for Web option in Photoshop for best results. If you place PDF files in your InDesign document, use non-flattened PDF 1.4 or later to avoid unwanted white lines. To get the best color fidelity, use RGB color images instead of CMYK or LAB. For non-interactive content, you can use any image type. Non-interactive content is resampled as an image with the same dimensions as the folio size. For guidance on creating interactive content, see Best practices for creating overlays. 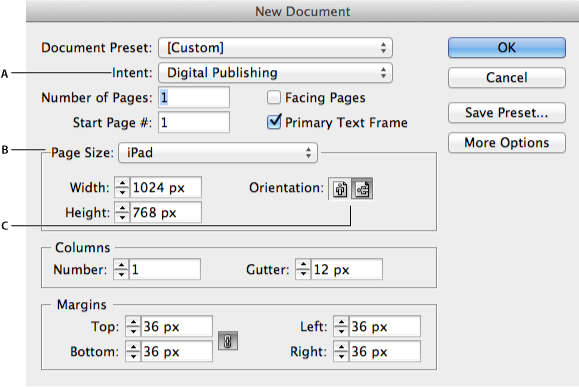 InDesign includes several features that simplify the DPS workflow. See the links below for more information on these features. If you create alternate layouts, you can create articles based on these layouts through the Add Article feature or by creating a path-based sidecar.xml file and using the "Import Using sidecar.xml" option in the Import Article dialog box. For information about path-based sidecar.xml files, see Importing articles using path-based sidecar.xml. In InDesign CS6 or CC, choose File > New > Document. For Intent, choose Digital Publishing. For Page Size, specify the target device such as iPad. If necessary, change the width and height values. The standard definition iPad models use 1024x768 pixels. The high definition iPad uses 2048x1536. For best results, create a 1024x768 document, and use PDF image format so that the content looks good on all iPads. A 6-pixel area on the right side of the page is cropped on the mobile device. The actual design area is 1018x768 (or 762x1024) pixels for SD iPad models. For Android devices, content in an Android viewer is scaled up or down and letterboxed as needed to fit within the display area. See Creating documents for multiple devices. If you want to allow smooth scrolling, you can specify a custom page size (such as 1024 x 3000). See Smooth scrolling articles. For Orientation, choose either Portrait or Landscape. Leave Primary Text Frame selected if you want your text to reflow when you create alternate layouts. If your article does not have a main story thread, deselect this option. Not all InDesign interactivity features are supported in the digital publishing workflow. For details, see Supported interactivity features. Create a second document that has a different orientation. When you save the files, include _v and _h suffixes in the filenames if you want to import articles. For example add an _v suffix for the vertical (portrait) document, such as article_v.indd.